If you are looking for a nice LED TV under Rs. 30000 then you are at the right place. 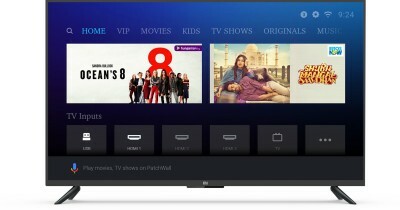 We have compiled a list of top 11 best TVs under 30000 in India 2019. Latest LED TVs launched in 2018 and 2019 by top brands like LG, Samsung, VU, Kodak, Mi, Sony are listed here. The price of LED TVs on this list is between Rs. 20000 and Rs. 30000. The size of LED TVs is from 32 inches to 50 inches. You will notice that LED TVs from big brands like LG, Samsung have a size of 32 inches and LED TVs from brands like VU, Kodak, Micromax have a size of 39 inches, 40 inches, 43 inches or even 50 inches. So this is the trade-off here. Big brands tend to be overpriced so at around 25000, you can either get a 32 inch LED of LG or Samsung or get a 40, 43 or 49 inch LED of brands like VU, Mi etc. You will find both normal and smart TVs on this list. On resolution side, you will see the Full HD 1920X1080p resolution display on most of the tvs while some have 4K Ultra HD resolution displays as well. Now let's take a look at the list of best LED TVs under 30000. You will find a brief review of each television with its specifications, pros cons and buy links. Blaupunkt introduced its LED products in 2018 in India in partnership with Flipkart. Blaupunkt is a German company and offers a wide range of great quality products in electronics. This is a 43 inch LED TV which comes with great design and quality. The display has a Full HD resolution and the visuals are crisp, the viewing angles are wide which enables easy viewing from anywhere in the room. The build quality is solid and the bezels are thin to make it look attractive. The colors are amazing and we found no issues or downside on the quality of an image or any video. Also, Blaupunkt puts a special focus on the Audio and you get dual speakers with total 30 W output enabling you to properly hear the tiniest of sound. The speakers in this LED are undoubtedly the best in the price range. Additionally, we would like to mention that this is not a smart TV but you can buy an add on Chrome cast or Amazon fire stick to get a similar feature and convert you non-smart TV to a Smart TV. A medium to a large sized room, depending on the viewing distance, is suitable for a 43-inch television and if you have a budget of under 20000, this is an overall decent TV with best sound output. It comes with 2 HDMI and 2 USB ports to connect external peripherals. There is a 1 year of warranty from Blaupunkt. 43 inch 4K Smart TV under Rs. 25000? Yes, it is possible now and this is one of the best options available. This TV comes from the brand Thomson which has launched a wide range of televisions and they have received really good reviews from customers. All their TVs are rated 4.2+ stars out of 5. This is because of good quality, great performance and aggressive pricing. This 43 inch LED TV from Thomson has an Ultra HD 4K resolution which enables you to see every minute detail while watching your favorites shows or movies. The display brightness is 550 nits which is one of the best in range and contrast is high which helps to create deep blacks. The color reproduction is on point and the images look very natural and lifelike. The audio output is 20W via the dual speakers and it is loud enough for more users. Audio is always a personal preference so if you need more loudness and bass, you can add an external soundbar or 2.1 speakers. It is a smart tv with a multi-core ARM Cortex CA53 processor, 1GB RAM, and 8GB storage. These specs are decent for smart tv and it is able to handle the app launches and switching with ease. Commonly used apps like Netflix, YouTube, Facebook, Gmail come preinstalled on this tv. More apps can be downloaded from the app store. You can connect the tv to the internet via a LAN port or using WIFI. For connecting set-top box, laptop, gaming console etc there are 3 HDMI ports and 2 USB ports available. Overall, it is an impressive 4K smart tv under 25000 and is one of our favorites as well. On the specifications front, this MI LED 4A comes with top-notch specs having a Quad Core processor with 2 GB of RAM and 8 GB of internal storage. This Android TV is based on the Android Oreo and covers various entertainment apps like YouTube etc. As in other smart TVs, there is a built-in Chromecast to quickly watch the photos and videos from your android or ios phone on the Television. The major overhaul has been made to the remote of the TV which now works on your voice commands as well. You can send commands like "Play latest movie" or change the channel number or increase/decrease the volume or even launch a gaming app or youtube etc. can now be done with the voice command which is powered by the Google Voice Search. This MI LED TV is the first TV under 30000 to have this feature. Gorgeous display, plenty of features and good sound quality make it one of the best smart TVs under 30000 in India. Android TV. Voice Control (MIC Button) to search for content. This is a 43-inch smart television from VU which comes with a Full HD resolution and an A+ grade panel. Given to all the specification, the display quality is really good for a television costing less than 25k and with its 43-inch design, it is suitable for a medium-sized room. It is a smart TV which runs on PremiumSmart Operating system and you can download various apps. Also since you will be using Netflix and YouTube a lot on this smart TV, VU has added dedicated buttons for them on the remote. With this television, VU has also provided a game centre where you get to access to 30 games for free and can play anytime when you want. The apps load smoothly and there is no lag seen in using the TV. Along with WiFi, this TV allows for ethernet connectivity to use it as a smart TV. For an overall great experience, VU has provided DTS sound technology into the speakers that have a powerful 20 W output and the sound is loud enough for a medium-sized room. For external connectivity, VU has added 3 HDMI and 2 USB ports on the side and back on the TV. This is one of the most economical 4K Ultra HD LED TV in India. At just under Rs. 30000, you get a large 43-inch display with Ultra HD 4K resolution 3840 x 2160 Ultra HD - which is 4X resolution of Full HD. More resolution means more depth in every picture. Plus, it is a Smart TV so you can watch content directly from the internet. It is powered by Andriod so you can download apps from the Google Play Store, browse the Web, connect with people on social media, check emails, play games. You can also mirror your phone screen to watch content on your tv by playing it on your phone. The TV comes with music mode where you can listen to music and the display would turn off. This helps to reduce power consumption when you just want to listen to music. The sound output is 20W through dual speakers. There are 2 HDMI and 2 USB ports available using which you can watch movies from your pendrive or laptop. While most brands give only 1-year warranty, Mitashi is offering 3 years warranty on this LED TV which is another major positive point. If you need a 43 inch 4K Smart LED TV under 30000 then this is a good option. This is a 4K LED TV from TCL with large 50-inch display size and Smart TV functionality and is priced under Rs. 35000 in India. It is a Smart TV and runs on the Linux operating system. You will see apps like Youtube and Netflix preinstalled. If you have a good internet connection then you can watch a ton of content directly via the internet. TCL has provided dedicated buttons on the remote to launch apps like Netflix. To connect external hardware devices like pen drive or laptop, you can use the 3 HDMI ports and 2 USB ports. If you need a 50 inch 4K LED TV under Rs. 35000 to 40000 then this is a good option. 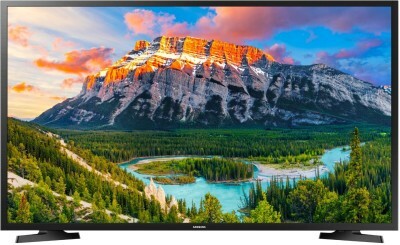 This is a value for money LED TV from Sanyo. It is not a well-known brand in India but their products are of decent quality. This particular LED TV is rated 4.3 stars on Flipkart by around 900 users which is really good and speaks of the quality product they manufacture. This quality was also reflected in our review test of this 49 inch LED TV. This is a 49 inch LED TV with Full HD resolution and has a slim design. The IPS LED has bright colors and the picture quality looks good. The pricing is simply excellent. You are not going to get a 49 inch LED TV at this price of around 30000. It has 2 speakers that deliver 20 W output and produces decent audio output. This Sanyo LED TV comes with 3 HDMI and 2 USB ports so you can connect your set-top box, Gaming Consoles, Laptops, Pendrive etc. After sales service is provided by Panasonic so no issues with that as well. So if you are not brand conscious, you can buy this LED as it is one of our top 10 picks for best full HD LED TV under 25000 and 30000. So, this was our list of best TVs under 30000 available in India 2019. We hope it was helpful for our users. If you are confused and still wondering which one you should buy then see our favorites below. 2. Our second favourite is TCL 49 inch Smart LED. You have to pay less than 30000 to get this beautiful 49 inch LED. So, if you want to save some money, spend around 30000 on this TV.